Home > Social Media Design & Management > If Social Media is Such a Big Deal, Why Do I Need a Website Too? You’ve even got a Pinterest, a YouTube channel and, at the behest of your teenagers who just know it’s a good idea, a Snapchat (they’re not necessarily wrong). You’ve cast your net far and wide with all of your social media accounts. You think your online presence looks good. So why should you have a website on top of all of those things? Do you really need yet another platform to manage and update? After all, can’t your customers just find you on Facebook? Because a great website is arguably more important and more effective than any one social media platform. 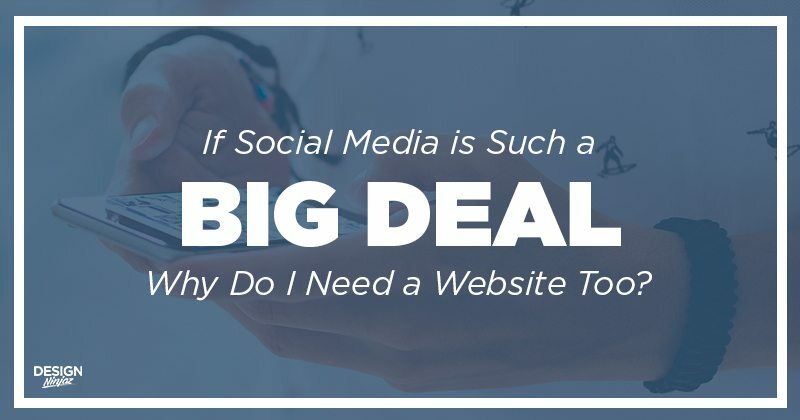 There are so many compelling reasons to have a website in addition to your social media efforts that it’s a bit difficult to explain in one fell swoop, so let’s take a moment and look at the big ones. Perhaps the best reason to have a website in addition to your social media accounts is that your customers expect you to have a website. By having a dedicated site, you’re showing that yes, you are a professional business. It adds credibility to your online presence. Here’s the thing about social media platforms—or any platform you don’t own yourself for that matter—you don’t have complete control over it. While this usually isn’t a big deal, it’s worth considering that you are more or less at the mercy of the Terms of Service of Facebook, Twitter, or whatever other platform you’re on. A great example of this is from back in 2014 when Facebook updated their News Feed algorithm. In the process, countless small businesses had their reach significantly decreased. What did Facebook tell them? Obviously Facebook is a powerful marketing platform,so none of this is to say that you shouldn’t leverage it to your advantage. However, keep in mind that nobody but you can dictate what you can and can’t do with your own website—and that’s the kind of security and longevity that most entrepreneurs and business owners find very attractive. 140 characters really isn’t enough room to explain the benefits of your business, or much of anything else. The reason your website is one of the most powerful marketing tools you have at your disposal is because it allows you to say exactly as much as you want to say, organized however you want, and in whatever manner you choose. A Tweet or Instagram post isn’t the right place to go into depth about the quality of services you offer, but your website is. Social media is how potential customers discover you. Your website is where they have the opportunity to learn why they should become a customer. One of the biggest problems business owners face with social media is figuring out what to post. When you have a website, you have something to share—especially if you have a blog. 140 characters might not be enough to say everything you want, but it’s a great way to share a catchy headline for your latest post. Furthermore, most social media platforms allow you to link to your site. In these cases, potential customers who have additional questions which may not be answered on your social media platform get the opportunity to learn more about you on your site. Once they’re there, your other marketing efforts can kick in, like building your mailing list or notifying them of a special sale. You have a platform for e-commerce. Email is still the dominating form of online communication, and a website allows your potential customers to reach you through it faster. A website allows you to gather analytics on who visits, when, and what they’re most interested in. This data can help you find areas of your business you need to focus on more often. It helps build your social media presence. A website can act as a “hub” for visitors to discover your other social media accounts. If you ever sell your business, a website will add value to it. Social media users are notoriously flaky. The platforms that are popular today could be replaced tomorrow, but your website will always be there. Social media is great, but it’s better to have total control over your assets whenever possible. A website is exactly that: a marketing platform that you control completely. If you’d like to learn more about how Design Ninjaz can help you with your website or social media campaign, we’d love to hear from you.